Rockville, MD, September 24, 2018—Sparks Group, headquartered in Rockville, MD with operations throughout Maryland, Virginia, DC, and North Carolina is joining staffing and recruiting firms from across the U.S. in celebrating National Staffing Employee Week, September 24–30. Established by the American Staffing Association, this commemorative week honors the millions of temporary and contract employees working for U.S. staffing agencies each week. According to ASA, in Maryland alone, 42,200 temporary and contract employees work in the staffing and recruiting industry every week. These positions are across a plethora of industry sectors and categories, and the majority are full-time. These jobs also can lead to permanent work, according to ASA research. National Staffing Employee Week salutes the temporary and contract employees who contribute to the economy of Maryland, Virginia, the District of Columbia, North Carolina, and that of the entire nation. From all of us at Sparks Group, we would like to sincerely thank each and every employee that represent us so well every day at our clients' worksites. To view staffing statistics in your state and learn more about the staffing and recruiting industry, visit americanstaffing.net. 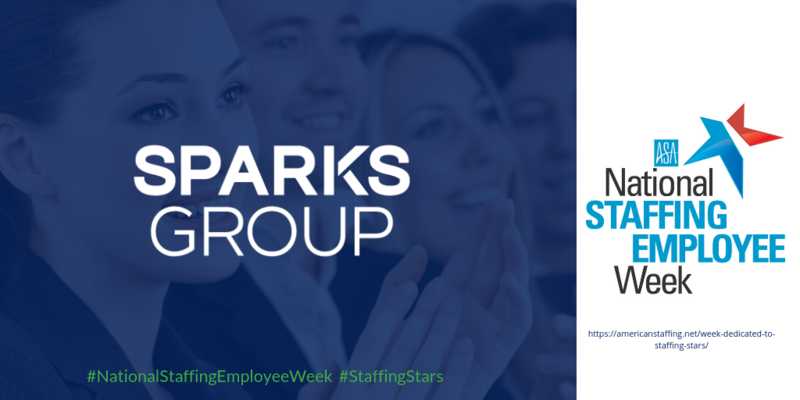 Sparks Group is a leading temporary staffing and full-time recruiting services provider connecting great talent to great companies in MD, VA, DC, NC, TX, and beyond. Each of our four divisions (Office, Accounting & Finance, Information Technology, and Creative) specializes in placing professionals in temporary/contract, contract to hire, and full-time roles across a diverse array of staffing categories. Sparks Group brings over four decades of experience placing professionals in challenging and rewarding positions at many of the area’s most prestigious organizations. Our primary focus is presenting opportunities that match each candidate’s skill-sets, experience levels, career objectives, and growth needs. Sparks Group has regularly ranked as one of the top US staffing and recruiting firms having been named to Inavero’s Best of Staffing Lists® for Client Satisfaction and Employee Satisfaction. Additionally, Sparks Group is proud to have been recently selected for other awards such as Staffing Industry Analysts’ Best Staffing Firms to Work For, the Washington Post’s Top Workplaces® List, Forbes® Best Professional Recruiting Firms, Washington Business Journal Best Places to Work, and the National Capital Business Ethics Award.